This photo was taken March 1st 2015. If you look into the sun you won't see anything. And if it's a hazy day and you look behind you, you won't see your shadow. And if the sun is in an inconvenient place - you won't be able to move it. The path! See the path? BUT. If you don't know what something is like now you may fail to realise how much it has changed when you reach the future. By then, you'll either have forgotten what was or be so overwhelmed by the present that you won't care any more. I'm not being philosophical. It's a fact. 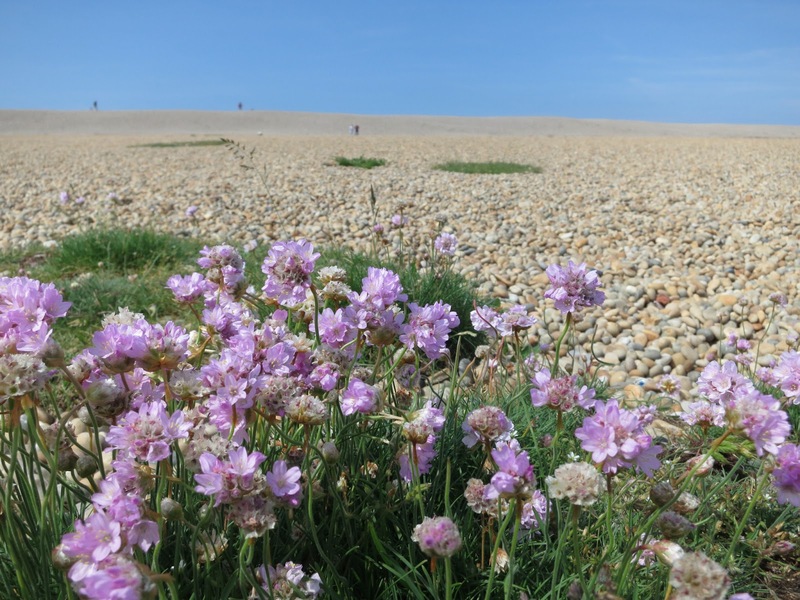 Last year I showed what the foot of Chesil Beach is like when thrift is in flower. 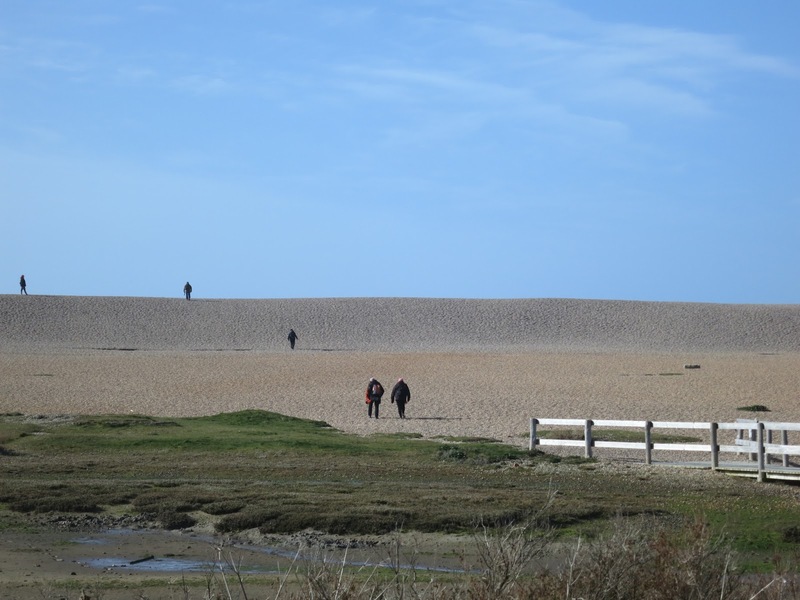 I was also able to show you the context, how there are plants on the landward side of this huge, huge, long, long mound of pebbles, even though they fade out as you walk up and up till you see the sea down, down, down on the other side. It was sunny on Sunday. But it was hazy too. 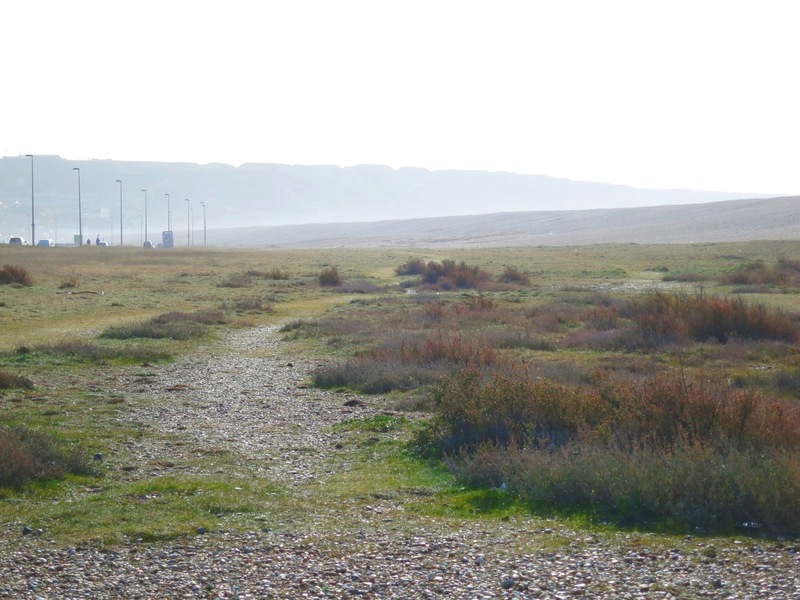 And spray from the sea was misting the air where Chesil Beach meets land at Portland. So even though masses of people had come out walking in this suddenly pleasant weather, it wasn't a good day for photographs. Which is a bit of a daft thing to say beside a picture dominated by a deep blue sky. But that's because I was looking in the other direction when I took it - away from the sun. A good principle! And at considerable distance from the cold sea spray. Another good idea when carrying a camera! BUT (the point of the first BUT) if you don't see it now, you won't be as surprised as you will be when the thrift is out in May. I found it hard to decide. Should I provide you with an exceptionally boring post . . . ? Or shall I show you what will happen . . . ? I was going to go with boring - but by the time the time the flowers come out you may have forgotten what it's like now. So . . . here we are with a now, compared with a then, which by previous years' experience will be what it will be in a couple of months' time. Miracles! Then we turn round and cross the road. 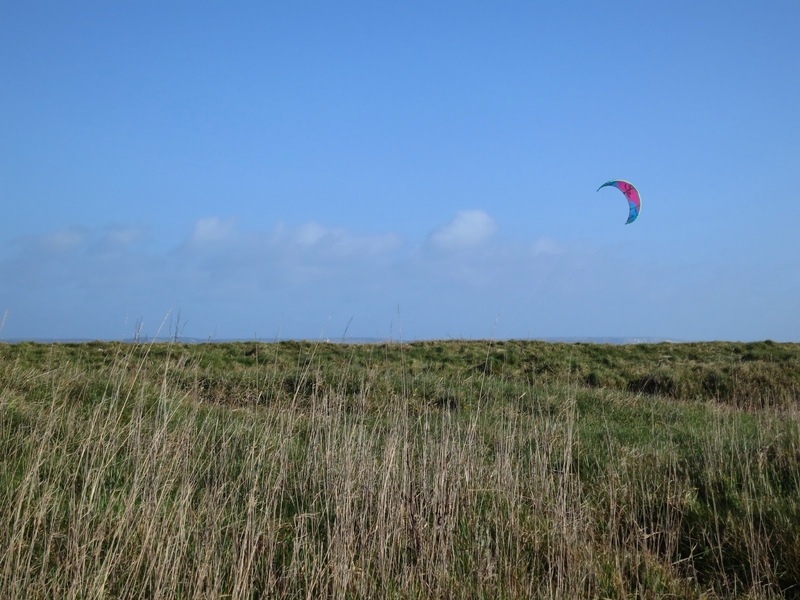 Portland Harbour (over the bank) is a great place for sailing and kite surfing. Here it is now. The grass is a bit drier than it looks in this picture. and here is the 'will be'. Shall we make a date for May? But first: The Tree Following Link box opens at 7am on 7th March and closes on the 14th. (UK time.) See you there! 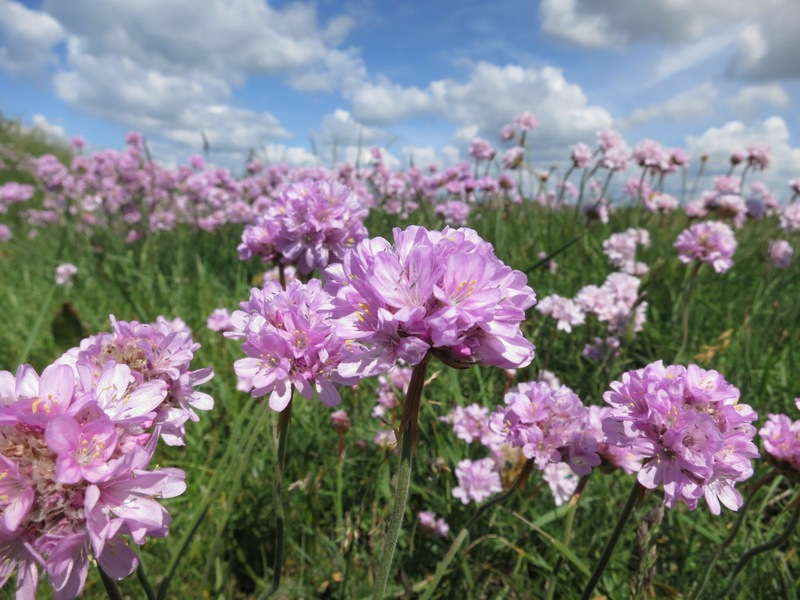 I love to look at last year's spring & summer photos and dream of the what's to come! Looking forward to seeing your "what's to come" photos for May! Good point you're making. So many things in nature call for familiarity with a place over the seasons to fully appreciate them. And it's the change itself as much as the actual plants or birds that is the miracle. Looks such a beautiful place even without the flowers, and it was lovely to hear the Lark's singing. I also look forward to your "will be" pictures Lucy. The path looks nice to walk in any season though. 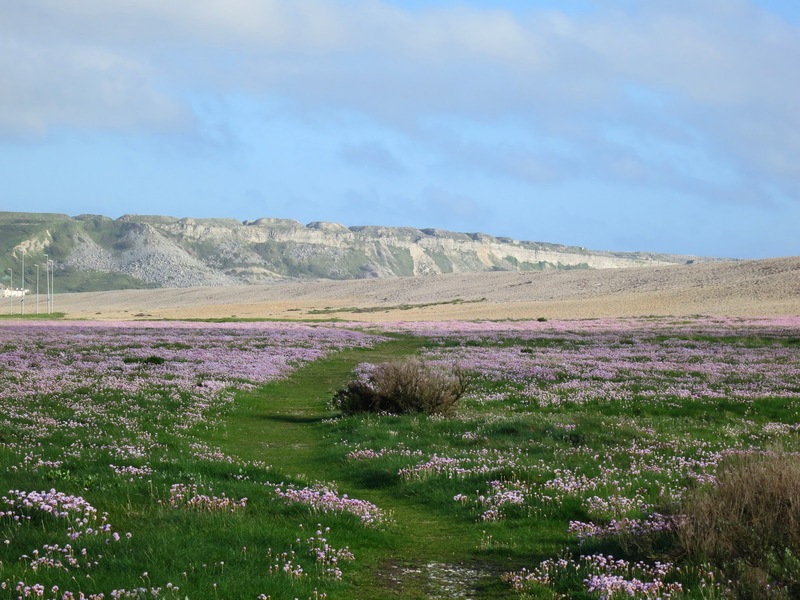 Looks lovely - haven't been to Chesil Beach Area for a while MUST do something about that. I fell in love with your thrift pictures when I first saw them last year. Wonderful landscape! And interesting to see the scene before/after. I wonder how confident we are that the flowers will always bloom again? I used to think books should be read in the right order, too, but now can happily read a sequel before a prequel. going to plant some thrift in my garden. Not one of ours but we are nearish to the sea.